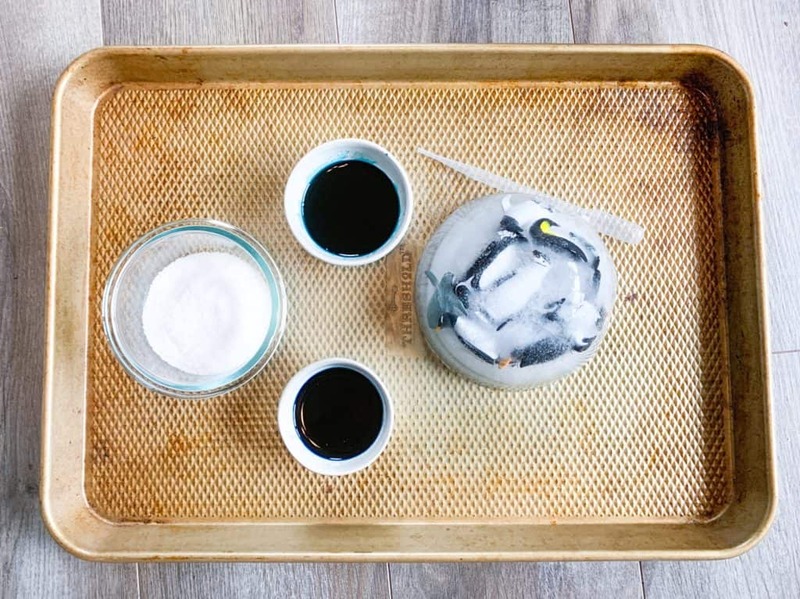 This salt and ice experiment encourages kids to do some critical thinking. 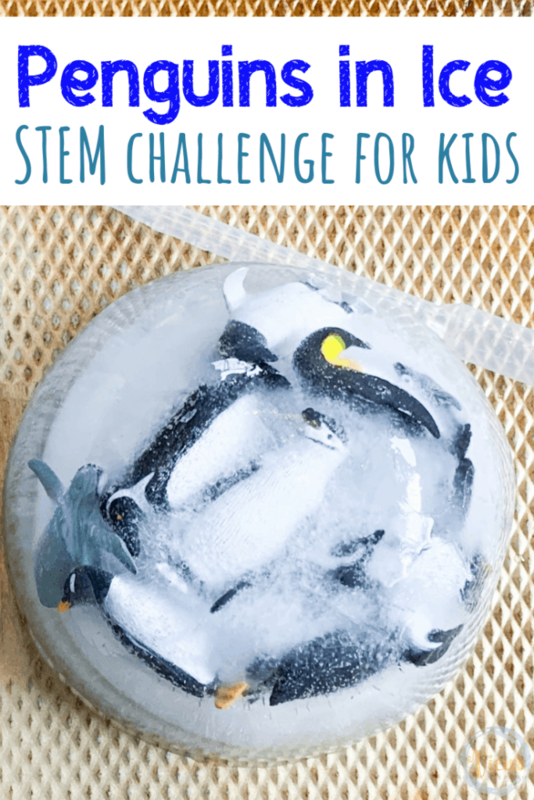 A fun penguin themed STEM activity for kids using salt and water to melt ice. 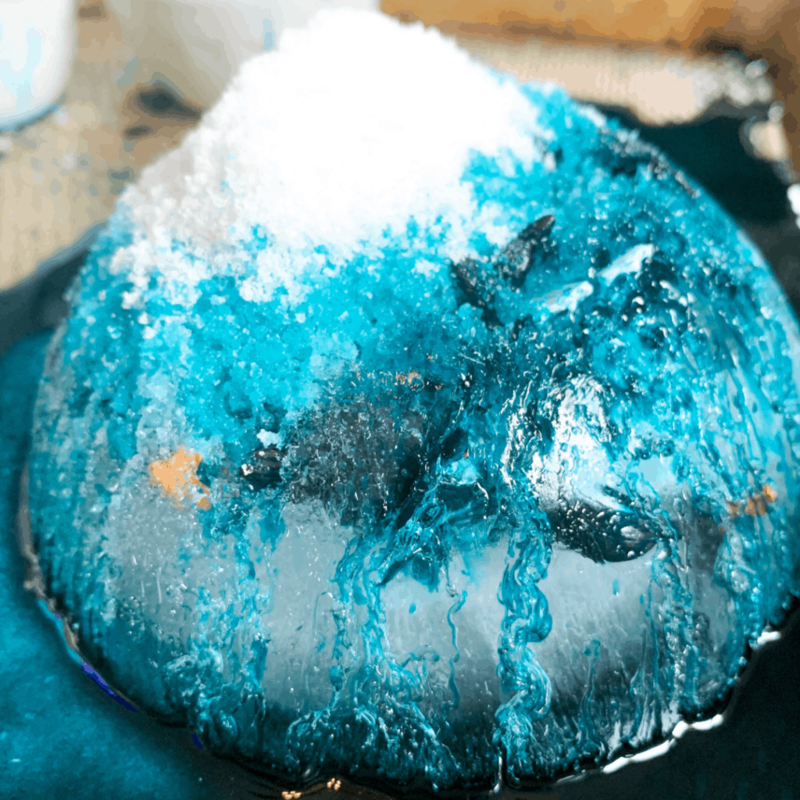 Playing with ice is such a fun way to engage in science fun with kids. Ice forms when a water freezes to a solid. This alone is a valuable science lesson for kids! 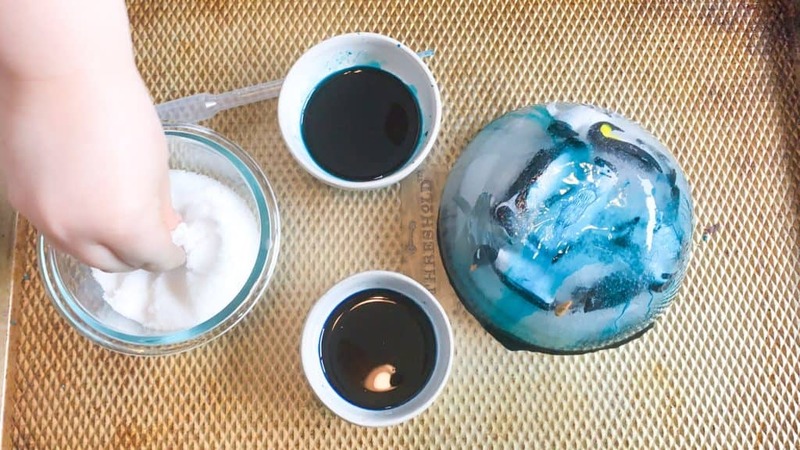 In this fun ice experiment, the penguin are trapped, and the kids needed to use salt and water to melt the ice and free the penguins. What fun! We love to hide treasures inside ice and free them. Because ice takes a bit of time to melt despite the method, this is an activity that can keep my kids busy for a while. It tests their patience and grit, and gives them a sense of success and gratification when they animals have been freed. 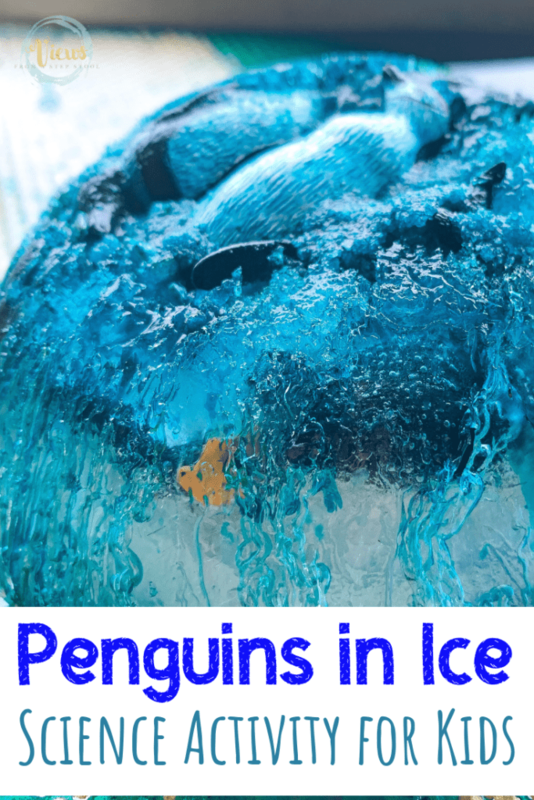 In this ice activity, we used colored warm water and salt to help the ice melt and free the penguins. 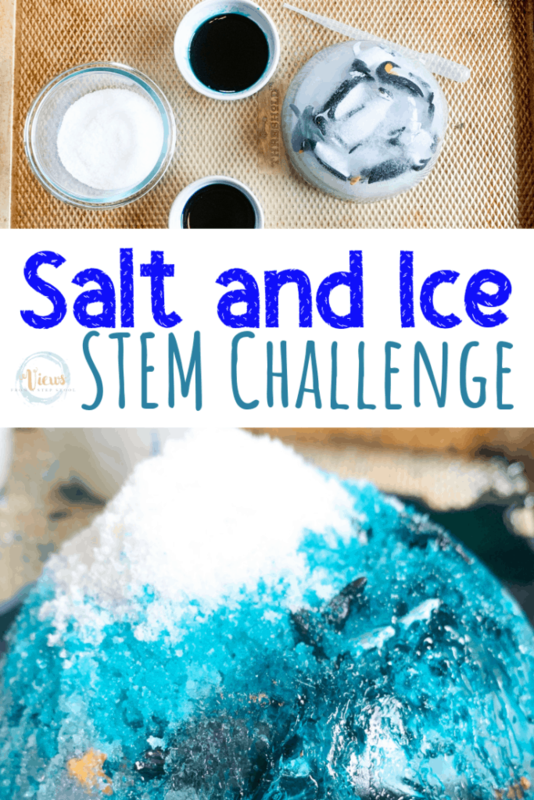 What a fun STEM challenge for kids to explore. 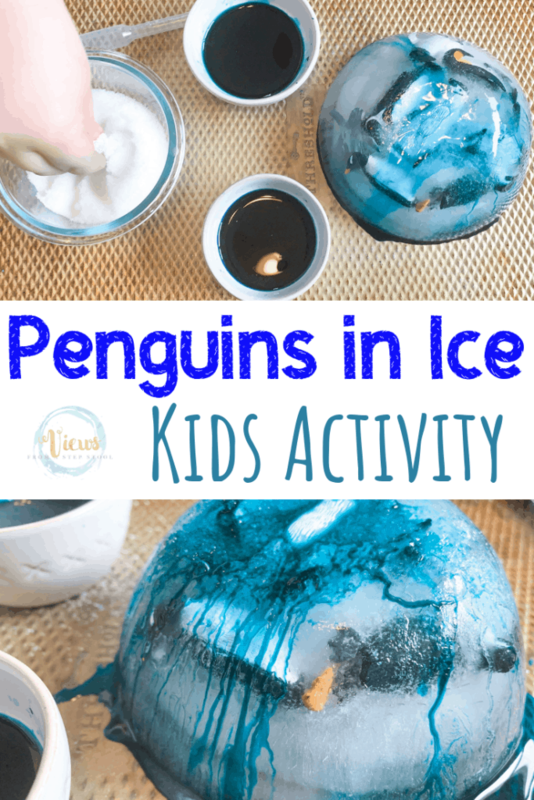 Prep this activity by freezing some penguins in a bowl of water. 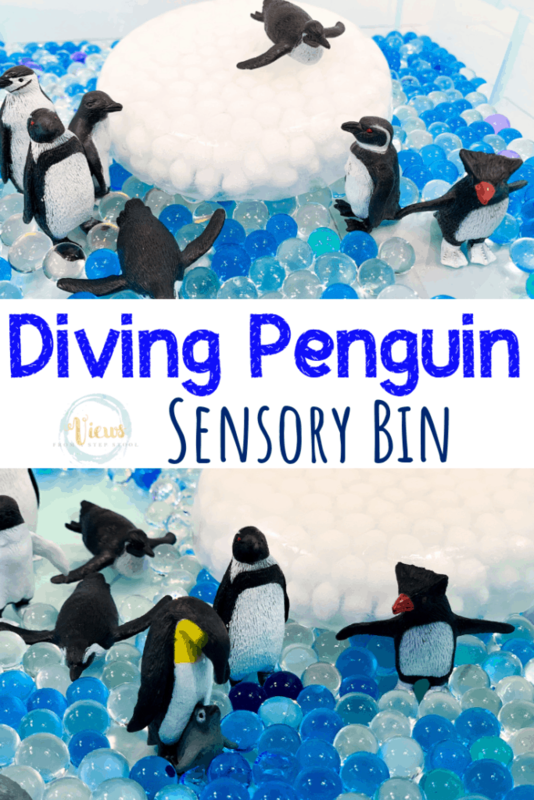 My kids enjoyed helping with this step and made up a story about a family of penguins that were swimming when an iceberg formed around them. I just adore activities that spark creative thinking and story-telling. They played and splashed around in the water a bit, adding details to their story before we put them in the freezer for our iceberg to form. 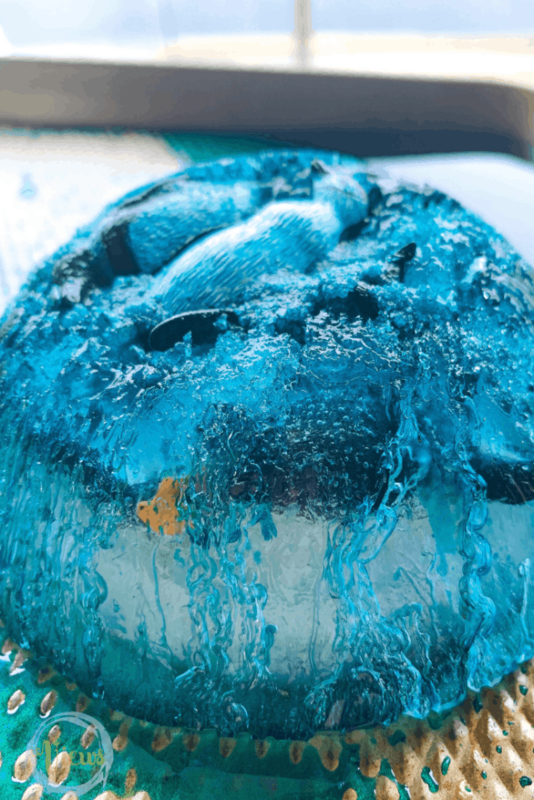 Once the bowl of penguins has frozen, remove the block of ice from the bowl and place it on a tray. We used a baking sheet to contain the water, but any tray would work. In two small bowls, we added some warm water and food coloring. The more food coloring you use here, the prettier the ice will look when you add the colored water to the block of ice. In another small bowl, we added some finely ground rock salt. This was what we happened to have in our cabinet, but coarse rock salt will melt the ice even faster. Place a couple of droppers or spoons on the tray for the children to use with the colored water. I like to use droppers here because the pinching of the dropper is great fine motor practice, and helps with handwriting! Kids will quickly see that dropping the warm water and sprinkling the salt on the ice creates little melted trails of water. Bonus, this looks beautiful! 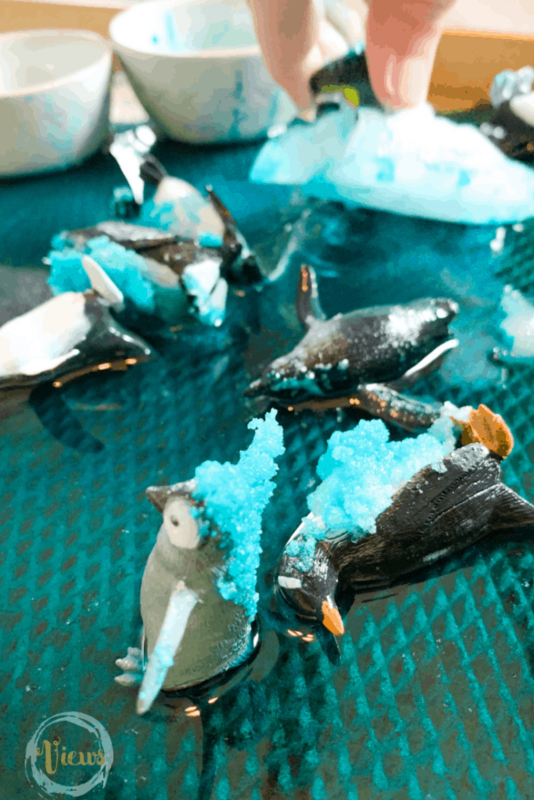 Over time, as kids continue to add water and salt, all of the penguins will be free! Success! How can we help free the penguins? What do you think will happen when we put the water on the ice? What do you think will happen when we put the salt on the ice? The kids will be more than happy to start experimenting with the materials and help free the penguins! What is the science behind this activity? Salt melts ice and help prevent re-freezing by lowering the freezing point of water. This phenomenon is called freezing point depression. There are a few different experiments you can do with kids to test this phenomenon, one of our favorites is to make ice cream without a freezer. 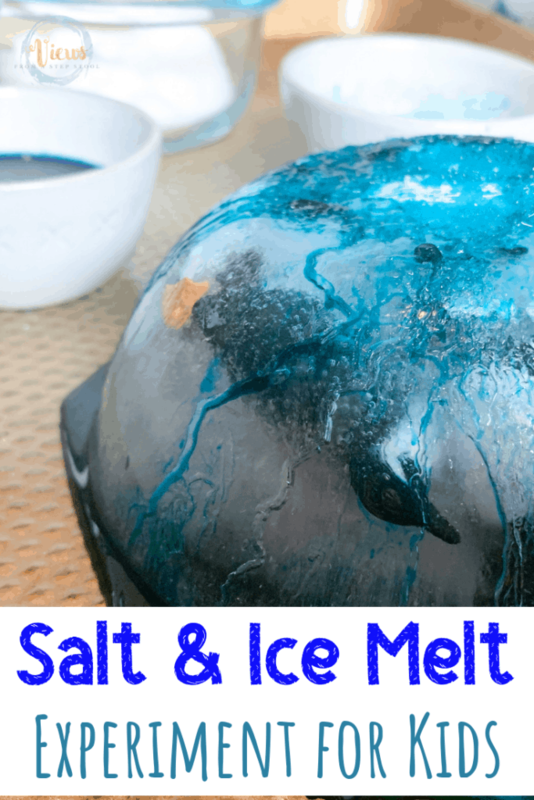 Have so much fun with this salt and ice experiment for kids while you free the penguins! 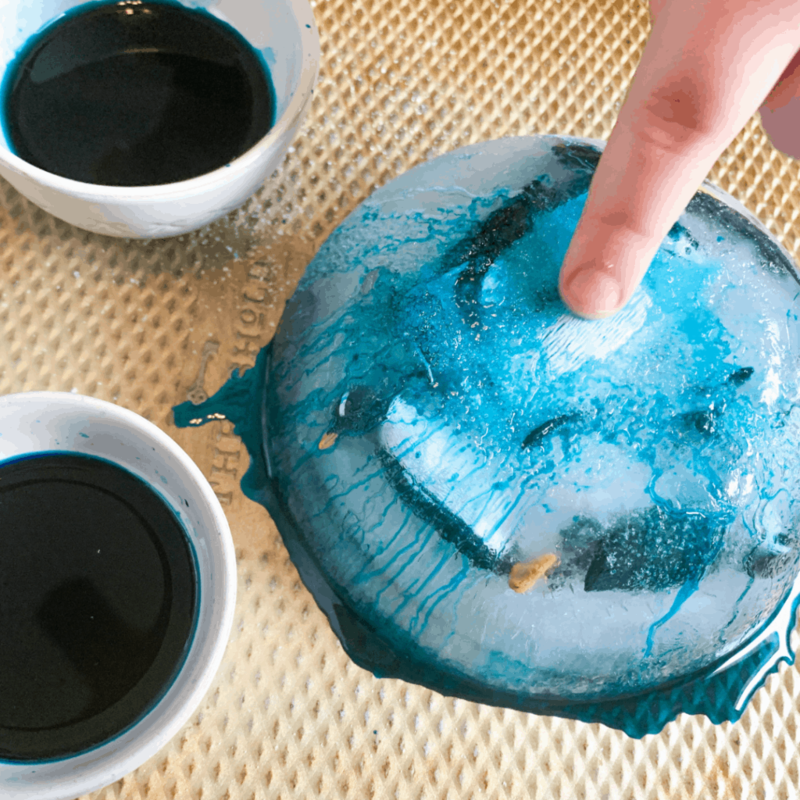 Pin this ice experiment for kids!